Bob Dylan The Times They Are A-Changin' on Numbered Limited Edition 180 gram 45 RPM 2 LP. Stark, Austere, Acoustic Record Dylan's First With All-Original Material. 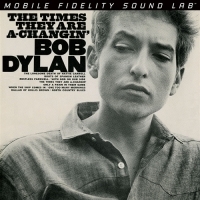 Immediately distinguished by the you're-either-with-us-or-against-us messages of the landmark title track, Bob Dylan's The Times They Are A Changin' sounds an unmistakable clarion call on behalf of progress and its unstoppable advancement. One of the Bard's trademark songs, it remains a timeless anthem with a clear sense of common purpose, a musical line in the sand that helped unite various social movements and multiple generations. The reverential 1964 record feeds off the opening tune and its unmistakable sentiments, marching forward to confront racism, poverty, injustice, and upheaval in a stark, immediate manner unlike few albums before or since. Marking a shift from the looseness and comedy that pepper the preceding The Freewheelin’ Bob Dylan, The Times They Are A-Changin’ skirts any attempt at humor, sarcasm, or goofiness in favor of utmost seriousness and severity. Seemingly anticipating the dark events surrounding President Kennedy’s assassination and the turmoil that followed, Dylan eliminates with conjecture and disguise. Akin to dispatches from the typewriter of literary icons John Steinbeck and William Faulkner, his songs give voices to the voiceless, challenge cultural precepts, upend traditional beliefs with rapier wit and truths, and underline tragedies swept under the rug. In doing so, Dylan creates stinging protest music that rallies against unchecked authority, discrimination, brutality, and division. A testament to the power of great art, The Times They Are A Changin' is a righteous assault on ignorance and agent for sweeping action, a necessary impetus for transformation and enlightenment. Via bold originals such as the nonfiction “The Lonesome Death of Hattie Carroll”, assertive “Restless Farewell”, and semi-autobiographical “North Country Blues”, Dylan casts hardships, greed, and victimization in such relatable terms it’s impossible to turn away and ignore their implications.